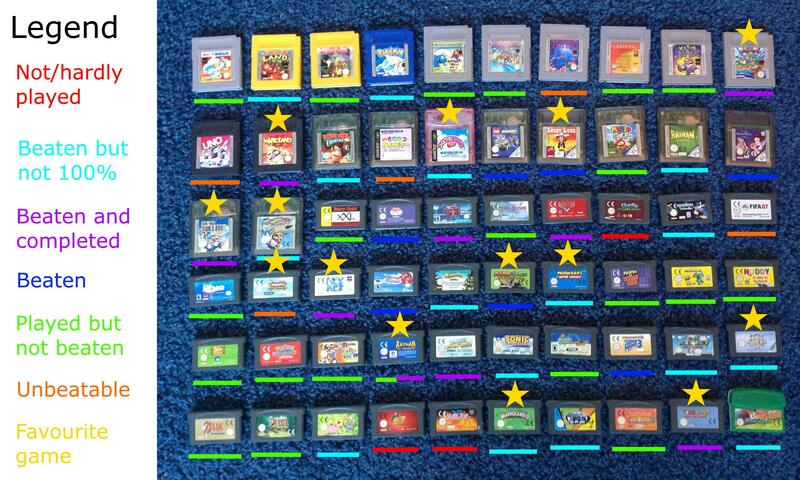 Monday morning I got the idea of laying out all Game Boy games I had on me and in my room. This was my entire collection, minus two games that were at my parental home, some games that I've lost (so maybe they aren't part of my collection anymore :P) and plus one game my brother technically owns. Then later I got the idea of making an overlay indicating what games I've beaten, and maybe what my favourite games are. I carried out that idea in the evening. The games are in alphabetical order, per system (first classic Game Boy, then GB/GBC, then Game Boy Color only, then Game Boy Advance). Not/hardly played means I haven't taken the time to play the game yet; I add 'hardly' because these games are games my uncle gave me, as they were his kids' but they don't play them anymore. I have however played these games when I was a kid myself, when sleeping over at my cousins'. Beaten but not 100% means I've got to the end of the game but there are still things left to do before I would consider the game completed. Usually this regards tracked collectables. Beaten and completed should be clear from that. Beaten is used for games where I've got to the end of the game and there's not much more to it. Or at least, whatever else I might do in the game won't give a different result, so beating the game at all is 100%. I separated this from Beaten and completed because it's usually less effort. Played but not beaten should be obvious. These are mostly games I'm still playing or planning to pick up again later, but some of them I'm not expecting to finish. Unbeatable means the game has no end. Very nicely organised! You should definitely give that Tom&Jerry GBA game a try, I think you'll like it. It's actually not that terrible at all. I've always enjoyed it, even though I never got past the third stage. Remembering owning two copies of WL3 as well as Mario Bros Deluxe. Never understood if it was a port or it had anything special it's been such a long time, glad you've completed it hope you've also enjoyed these games as well as I did when I was a kid, a lot of your post here makes me think of nice childhood I had. Super Mario Bros. Deluxe certainly has a lot of content! It was my first game, and also @wariolandgoldpiramid's. It's got the original game, a challenge mode where you can play each level separately to find 5 red coins, find a hidden Yoshi egg, and beat a certain high score, a race mode with 8 new levels to play against another player or a CPU-controlled Boo, and even the first 8 worlds of the Lost Levels! And then there are a lot of extras: images to print (if you've got a Game Boy printer...), a song composer, a calendar and a fortune cookie simulator. It's really quite the package! Wow, never knew it had that much content. Maybe I will buy it someday.